When you start working with Yuki, you get standard access to a complete online accounting package that includes a complete digital archive, the ability to create and send online invoices and a financial dashboard. All the conveniences of online accounting but with the important advantage that any knowledge in the field of accounting is not required. All documents processed by Yuki are immediately stored in a well-protected digital archive and saved in transparent binders. 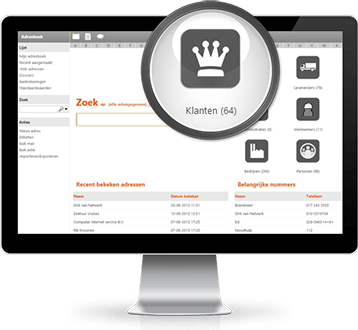 Each binder is again divided into tabs with different types of documents such as invoices, receipts, propositions and contracts. You never have to search for documents again. Everything can be recovered in the shared digital Yuki archive. The top shelf is for accounting and the lower shelves can be used for the entire archive of your business. When using Yuki’s dashboard, you are completely in control of your financial administration. Always understand the situation. Always have current figures at hand. Thanks to your personal dashboard, you are constantly aware of all operating results and expenses, sales, debtors, creditors and your bank balance. All graphs are interactive and if you click further, you will find the original source document. 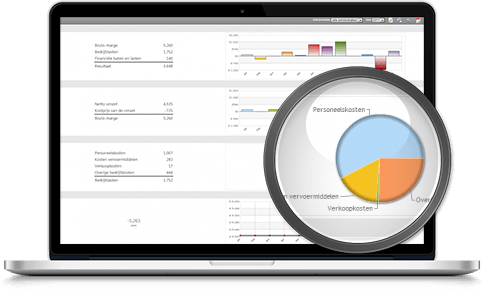 The accounting software developed by Yuki allows you to create sales invoices. When transmitting from Yuki, these are recognized directly in the accounts. If you frequently send the same invoice to a customer, you can use the “repeated invoices” option in Yuki. So when it is time to introduce a new bill, it is automatically processed. You can design all invoices according to your own corporate style. Do you have a bank account with ING, ABN AMRO or Rabobank? Then your bank automatically delivers your daily statements to Yuki. The result is an up-to-date accounting system that provides both operational and management information. Member of another bank? No problem. Download your bank statements and import them into Yuki’s accounting software. Suitable for (almost) all Dutch banks! With one press of a button you are in touch with your personal Yuki backoffice employee. Alongside you get access to a convenient CRM functionality that consists of an address book with additional information about your data from your administration and archive. Save all invoices, contracts, emails, proposals and remaining correspondence under the relevant relationship. You can retrieve all correspondence instantaneously. Furthermore, you can monitor the payment behavior of all your relationships. There is an easier way to do your bookkeeping with Yuki. Since it is possible to link Yuki with your Dropbox account, you can share your Dropbox directories with us. Here you store the documents that need to be processed in your bookkeeping. A moment later they are processed and automatically saved as a document in Yuki’s archive. Scan, upload to your Dropbox and you are finished! To make Yuki even more accessible, we have developed an App for iPhone and Android. Swiftly consult a particular bill or search a policy? You only need your phone! The entire digital archive can be accessed via folders. Get directions and check your sales list. Take pictures of your receipts and send them directly to Yuki. It is possible to expand Yuki’s accounting software with additional software functionalities. All additional modules are easy to order through your personal Yuki portal. You are given the possibility to try out all modules for one month. If you don’t like it, simply switch off the significant module. Do not waste time declaring your hours. Register and invoice with Yuki’s Timesheet module. 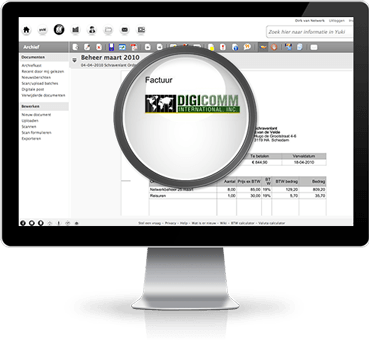 Add another dimension to your financial records for analyzing projects and files. Make arrangements with employees, manage the company’s agenda and send/receive emails. When booking your invoices, Yuki checks if purchase invoices still require a payment transaction. This service helps you to quickly receive money from customers through a well-timed and considerate process. Makes Yuki suitable for working with foreign currencies. The software will then be expanded with additional functionalities.